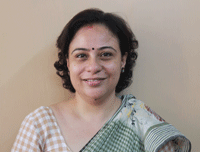 Dr Arijita Dutta is Professor in Economics in Calcutta University and co-editor of in-house journal Arthaniti. She completed her Master’s degree from Centre for Economic Studies and Planning, Jawaharlal Nehru University, New Delhi and PhD from University of Calcutta. Her research interest is Health Economics, Quantitative Development Economics and Applied Econometrics. Prof Dutta has a number of publications in National and International Journals to her credit and has completed many research projects. She has been closely associated with health policy making of the state of West Bengal and has published a number of policy documents on health care in West Bengal. She has taught in a number of European Universities and has been a visiting researcher at UNU Merit, Maastricht, the Netherlands in 2014.